Mindless Mirth: Harvest Moon, Jupiter, and Equinox on September 23! That's Today! 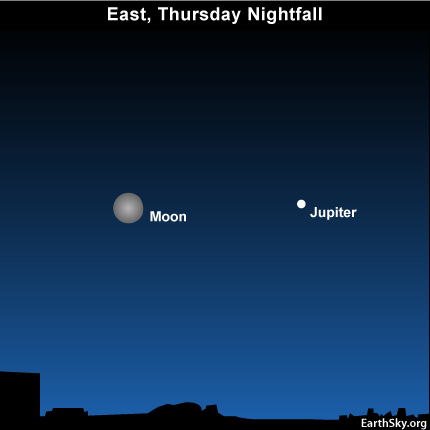 Harvest Moon, Jupiter, and Equinox on September 23! That's Today! On September 20, Jupiter was closer to Earth than it has been since 1963, and closer than it will be until 2022. It is now 368 million miles away. On September 21, Earth passed between Jupiter and the sun. Tonight, the Harvest Moon and Jupiter which is nearing perihelion (its closest point to the sun) will shine all night long! Tonight is also the first full night of the autumn season for those in the Northern Hemisphere. The September equinox is the start of autumn, and we call the closest full moon to the autumnal equinox the "Full Harvest Moon." This year, the Harvest Moon arrives 6 hours after the September equinox. The September equinox falls on Thursday, September 23, at 3:09 Universal Time. Converting the equinox time to North American clocks places the equinox on Wednesday, September 22, at 11:09 p.m. Eastern Time, 10:09 p.m. Central Time, 9:09 p.m. Mountain Time and 8:09 p.m. Pacific Time. For the moon and Jupiter to shine all night long on any equinox, three events, the opposition of Jupiter, the equinox, and the full moon, all have to happen at almost the same time. This year, the three events occur in less than two days. September 2010 is the only time in your lifetime that you’ll be able to see the moon and Jupiter shine all night during the equinox. So be sure to observe this once in a lifetime event tonight, the first full night of autumn.